Mention the town of Chesterfield to people and quite a number will think of the Crooked Spire on the parish church of St Maryâ€™s. Those with an interest in sport may well refer to the 1997 FA Cup semi-final, when the debate about whether or not the football has crossed the goal line was first sparked. Some locals may tell you that any time in the winter when Chesterfield needed a goalkeeper somebody would whistle down the pit and one would come up. Similarly in the summertime and Derbyshire needed a fast bowler the call would go down the pit and up came a miner. Few people would mention a racecourse. The first indication of racing in Chesterfield is to be found in 1692 in the parish records of Ashover, about 6 miles away, although there are no records before 1712, when a race called the Scarsdale Stakes was run. By 1728 the town had a regular three-day meeting in July, although only one race was run on each day. That year, day one featured a 40 guinea race for 6 year old horses, day two offered 10 guineas in a race for Galloways, and day three saw a 20 guinea purse for 5 year olds. Five years later the three races attracted just 10 horses between them, and the future of racing in Chesterfield was in serious doubt. The racecourse was situated about a mile and a half north of the town, in an area known as Whittington Moor. Horses, owners, jockeys and grooms all stayed at the coaching inns in town, and the horses walked down to the course on the morning of racing. The races were a major event in the town, with people coming out to watch the horses make their way down to Whittington Moor. At one time the Vicar of Chesterfield stopped the old tradition of ringing the church bells on race days, as he felt it attracted people of ill repute. The original course was tight, narrow and flat, but in 1797 major alterations included doubling the width of the course and making it longer, so that it became a circuit nearly 2 miles round, with an uphill finishing straight of half a mile. The only other significant alteration came after the building of the railway in 1870, when the bottom bend had to be redesigned to bring it inside the path of the iron road. The Enclosures Acts, which gave common land in each parish to the Lord of the Manor, provided a potential threat to racing in Chesterfield. The circuit lay in two different parishes, Whittington and Newbold. The Whittington Award (1821) went a considerable way to ensuring the sport continued, as it stipulated that no buildings should be put up on or around the track and no coalmines opened in the vicinity. The act also required Henry Dixon, the Lord of the Manor, to maintain both the jumping fences and the track itself. The Newbold Award didn't follow until 1837, but as the Lord of the Manor here was the Duke of Devonshire, a great follower of racing, there was no serious threat. In 1829, a small grandstand was built, designed on similar lines to one at Doncaster, which had been opened a few years earlier. The Duke of Devonshire put up Â£50 and a further Â£147 was collected locally. But this was not enough to cover the building costs, and as late as 1842 more than Â£200 was still owed to the builder. A subscription scheme was set up in which anyone who put up more than Â£5 received a Silver Ticket, about the size of a 10p piece, which gave them free entry to the stand in perpetuity. This was followed in 1852 by the mounting of posts and rails to mark out the track, and finally, in 1853 a wooden stand with a pagoda shaped roof was built for the judges. One of the major patrons was George Stanhope, 6th Earl of Chesterfield. In 1840, having seen Crucifix, a horse he had sold to Lord Bentinck for Â£60 as a two-year-old, win the 1000 Guineas, 2000 Guineas and the Oaks (all in 1840), Stanhope gave up the high life of London and retired to his estate at Bretby Hall, near Burton on Trent. Here he set up his own stables and laid out a new track on the hilltops, the layout of which Bentinck in time borrowed as he helped to develop Goodwood. It's this connection that led to the Chesterfield Cup being run at Goodwood for many years. Meetings continue to be advertised in the Racing Calendar until 1877, by which time Chesterfield Racecourse Committee was unable to guarantee the prize-money needed to continue to race under Jockey Club rules. However, this was enough time for Chesterfield to put its little mark on racing history, and it's one we should particularly remember today. On 28 September 1870 a 13-year-old lad weighing barely five stone rode his first flat race winner. There was a stone and a half of lead in the saddle of Mr Bradley's Atholl Daisy in the two-year-old nursery, more than a quarter of the bodyweight of the young Fred Archer. I don't know what Fred picked up for winning on the 3/1 shot, but a grateful Mr Bradley sent his father a pound of green tea. Archer went on to top the jockeysâ€™ table for 13 years, winning 2748 of the 8004 races in which he rode. At 5'10" he was exceptionally tall for a jockey, and existed on a diet of oranges, sips of champagne and Turkish Baths in an effort to keep his weight down. On 8 November 1886, exactly 125 years ago today, when Archer was suffering both typhoid fever and depression, he sent his nurses away, took out a revolver from the bedside drawer and shot himself. 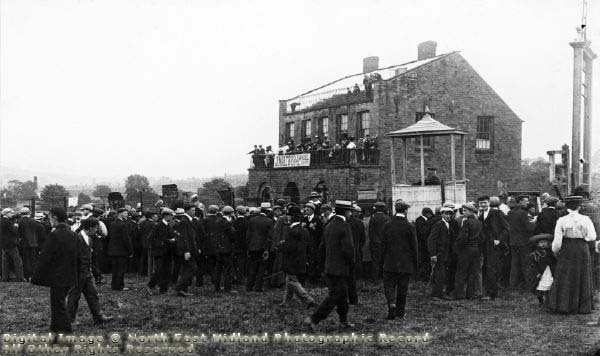 Racing continued in Chesterfield with â€œflapperâ€ meetings that coincided with Bank Holidays in spring and autumn. At these, the attractions of the boxing booths, tradesmen stalls and fairground were at least as great as the racing itself. By the start of the 20th century many houses had been built on the land inside the racetrack, including the one where I made my entry into the world some 50 years later. And in 1922 the town council decided to put a Bill before Parliament to remove the right to hold horseracing on Whittington Moor. The following year Chesterfield Corporation agreed to give the race committee Â£250 to vacate the course and to cover any debts that arose in doing so. The final meeting took place on 29 July 1924, when a shortage of jockeys led to the call for any local rider to come forward. Up stepped George Smith, who had served as a groom with the Royal Horse Artillery during the First World War. He had a remarkably successful day, riding the treble in the last three races ever to be staged at Chesterfield racecourse. 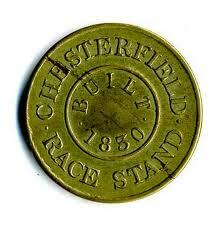 Today there is very little to remind us of the existence of racing in Chesterfield. In the last few years The Racecourse Tavern has closed. But there is Racecourse Road, which is on the top bend, and Stand Road and the adjacent park, which are immediately outside the home straight. And many more people than will ever realise it travel along the back straight every day. If you take the train from Chesterfield to Sheffield, there's an embankment just beyond the Tesco store and the new football ground. The road immediately beneath the embankment was built on the back straight of Chesterfield racecourse.